The Amish are famous the world over for making beautiful Amish quilts, handcrafted wooden furniture, delicious Amish baked goods, and other crafts. Millions of people travel to Amish country from all different parts of the world to have a look at their unique way of life and purchase some of their high-quality Amish crafts and goods, including Amish quilts. While the Amish typically shun modern society, they also depend on it for their livelihood, so the Amish sell their Amish quilts, wooden furniture, and other goods throughout the year in their local markets, but they also hold auctions several times a year for both the locals and tourists to attend. These Amish auctions are a great way to see the Amish with their beautiful Amish quilts, wooden cedar chests, or handcrafted Amish toys. There is something for everyone at the Amish auction. For the men, farm equipment, handmade tools, decorative metal accessories, and other industrial type items can be found at the Amish auction. These items are usually bought and sold by the Amish themselves, but anyone is welcome to bid on any item that is put on the block at the auction. Retiring Amish might want to unload some of their unused farming equipment and younger Amish men who are just starting out might be looking for cheaper tools and equipment to buy for their farms or businesses. The one thing to remember about the Amish is that they hate waste, so the Amish auction is a way to redistribute items within the community as efficiently and affordably as possible. For the women, there are beautiful handmade Amish quilts to bid on in the auction, and there are friends and family there to chat with as their husbands bid on a draft horse or farm equipment. Amish quilters spend months making a quilt, sewing each Amish quilt together, often using a treadle sewing machine because their houses do not have electricity, and hand quilting the final stitching and shadows into the quilt. Amish quilts are of such high quality because the Amish quilters believe that if you are going to do something you should do it right. Amish quilters have been passing down their Amish quilting techniques to their daughters and granddaughters for generations. While many women choose to only make their Amish quilts for family and friends, others have made a business out of making and selling their Amish quilts. Because of the high quality and attention to detail, many Amish quilts sell for more than a thousand dollars in the many Amish quilting shops that exist in most Amish communities. The Amish are also known for their finely made wooden furniture, crafts, and toys. Going to the Amish auction will give you the opportunity to see the many beautifully hand carved and handcrafted wooden items that the Amish men are able to make. 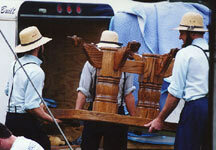 The Amish use traditional woodcarving techniques that have been handed down to them from generation to generation in order to create beautiful cedar chests, Amish quilt stands, bed frames, dressers, rocking chairs, picnic tables, and even little wooden toys and puzzles for the children to enjoy. The Amish build their wooden furniture without the use of electrical tools, nails, or other modern conveniences. Instead, the Amish use either hand tools or generator powered tools to make most of their wooden furniture and rather than using nails they put their pieces together using traditional methods that are actually stronger than most modern techniques. All of these wooden items can be found and bid on at the Amish auction. In addition to farming equipment, Amish quilts, and handmade wooden furniture, you will also be able to experience the many delicious smells and tastes that the Amish have to offer at the auction. Most Amish communities are farming communities and their products are highly sought after due to the fact that they use no chemicals or additives in any of their produce or livestock. As a result, Amish foods are as wholesome and natural as you can get, as well as incredibly delicious. Many Amish women are excellent bakers and they might sell their homemade pies, cookies, cakes, or breads at a stand outside the Amish auction. Amish women are also excellent canners of fruits and vegetables and you might find a collection of canned jams or preserves available using items that an Amish woman grew herself in her own garden. There will also be fresh cheeses, milks, eggs, meats, produce, and other farm produced foods that can be purchased directly from the Amish people who made them. There is just nothing like tasting food that has been farm raised or produced without chemicals, preservatives, or freezing. Once you taste these naturally made products, you just might find that you are considering the Amish lifestyle for yourself! All and all, you will find a visit to an authentic Amish auction an experience you will not soon forget. While the Amish separate themselves from society purposely, they also embrace the many people who come to visit them and enjoy making and producing their handcrafted products for tourists to buy. Whether you choose to bid on a beautiful handcrafted Amish quilt or just want to taste a bit of good old-fashioned Amish cooking, you will not be disappointed at the Amish auction. Even if you are just there to look at the incredible wooden furniture, touch the beautiful fabrics that are used in the Amish quilts, or take in the clean fresh air that Amish country always seems to have, you will definitely enjoy spending the day at the Amish auction.